Forty-seven percent—the highest percentage of $25 Million Plus respondents—consider themselves fairly knowledgeable, but allow that they still have a great deal to learn. 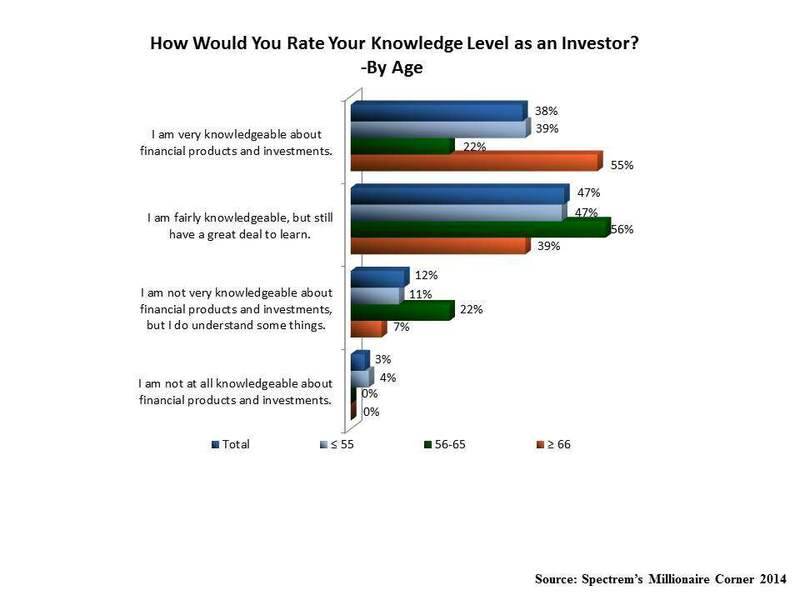 Nearly four-in-ten (38 percent) do consider themselves very knowledgeable about financial products and investments. Just 12 percent and 3 percent contend that they are either not very or not at all knowledgeable. With age comes wisdom in the confidence that the $25 Million Plus have in their financial knowledge. Of the 38 percent who consider themselves very knowledgeable about financial products and investments, 55 percent are seniors. Of those who self-report being fairly knowledgeable, the highest percentage (56 percent) are Baby Boomers ages 56-65. Not surprisingly, ultra-wealthy investors who make all of their own financial decisions without benefit of a financial advisor have the most confidence in their financial knowledge. Of respondents overall who say they are very knowledgeable, 58 percent are self-directed, while the highest percentage of those who are thoroughly dependent on their advisor (16 percent) contend they are not at all knowledgeable. Of those who say they are fairly knowledgeable, the highest percentage (59 percent) use a financial advisor for specific life events, such as asset allocation, saving for college or retirement planning, while 53 percent are advisor-assisted, meaning they regularly consult with a financial advisor, but still make most of their financial decisions themselves. It is advisors to whom the ultra-wealthy are most likely (70 percent) to obtain information and news about investments, the Spectrem Group wealth level study finds. Age is not a significant factor in where the ultra-wealthy turn to for news and information about investments. While those under the age of 55 are most likely to consult blogs, seniors over the age of 66 are most likely to seek out not only traditional sources such as the daily and weekly financial press, but also websites other than their advisor/provider. This underscores that overweening confidence in their financial knowledge.